Terrorism is often mistakenly thought of as a modern phenomenon, but it goes back quite some time. A History of Terrorism charts the history of political terror from nineteenth-century Europe to the multinational operations of Arab and other groups today. The question is: What is its true impact today and in the future? 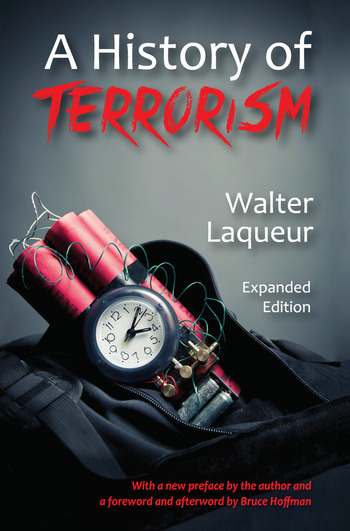 Laqueur addresses long-neglected psychological issues concerning the origins of and motivations behind terrorism, and examines the sociology of terrorism in depth: funding, intelligence gathering, weapons and tactics, informers and countermeasures, and the crucial role of the media depiction of the "terrorist personality". Systematic terrorism and current interpretations of terrorism, its common patterns, motives, and aims, are unflinchingly faced and clearly explicated. Laqueur ultimately considers the effectiveness of terrorism and examines the ominous possibility of nuclear blackmail. Originally published in 1977, this book is one of the two most quoted works on terrorism. This expanded edition features a new preface and important contributions by distinguished security expert Bruce Hoffman that apply Laqueur's classic and seemingly timeless work to contemporary terrorism issues.